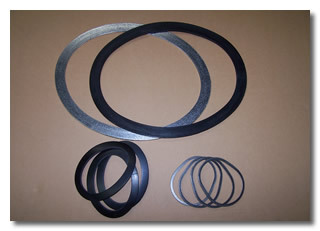 Topog-E ® Gasket Company – Series 180 molded rubber gaskets and Series 2000 exfoliated graphite foil gaskets. In addition, Hennig Gasket offers wire inserted fiberglass boiler gaskets and seals that are coated with a heat resistant rubber, and are rated for temperatures up to 380° Fahrenheit and pressures up to 180 psi (pounds per square inch). The Topog-E ® Series 2000 gaskets can be used in steam pressure vessels with extreme temperatures up to 1200° Fahrenheit (650° Centigrade). The Flexitallic ® line of spiral wound gaskets is ideal for handling temperature and pressure fluctuations, bolt stress relaxation and creep, as well as toxic and corrosive chemicals and media. Some types of Flexitallic ® spiral wound gaskets are reinforced with several layers of metal to provide better compression characteristics and greater stability. Some Flexitallic ® spiral wound gaskets feature solid inner metal rings, and external rings; other Flexitallic ® spiral wound gaskets are designed for heat exchanger applications, ring joint flanges, carrier ring configurations, space restrictions, boiler handhole and tube cap assemblies, boiler manhole cover assemblies, and with graphite fillers or PTFE fillers for outstanding sealability. As noted above, we are a distributor of spiral wound gaskets; however, working with our strategic partner, we can provide custom spiral wound gaskets, depending on your specifications. Hennig Gasket can also manufacture and fabricate custom gaskets and custom seals for your specific boiler gaskets and seals application. Our gasket fabrication services include hand cutting, die cutting and water jet cutting of the boiler gaskets and seals required. Take advantage of the experienced staff at Hennig Gasket by contacting us today for all your boiler gaskets and seals specifications!